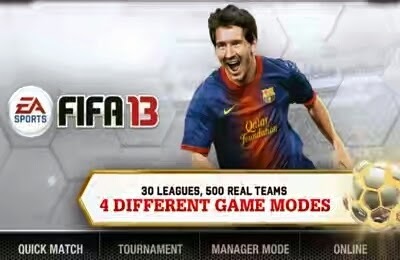 FIFA 13: is more realistic than ever – with all authenticity and innovation which you can expect from FIFA franchise. You get matches with innovative graphics and the most sympathetic control facilities ever provided on Android. A new Skill Move button allows you to choose your favorite dodges with simple swipe. Masterful free kicks and penalty with full touch management. Enter the game with realistic movements of the player on 360 °. Make passes splitting the protection, penalty and stylish tricks. For the first time ever! Compete with your friends at any time, using online multiplayer. Rise to the top of the board with results, using such super stars as Messi and Benzema to break your rivals from the whole world. The football club EA SPORTS allows you to join the competition of the real world, to support the favorite club, and to incorporate with your friends, competitors, and millions of other players worldwide. Raise the level and get experience to raise the status. You can relive all known football events of the real world through challenges in the game. Required Android 2.2 And High.